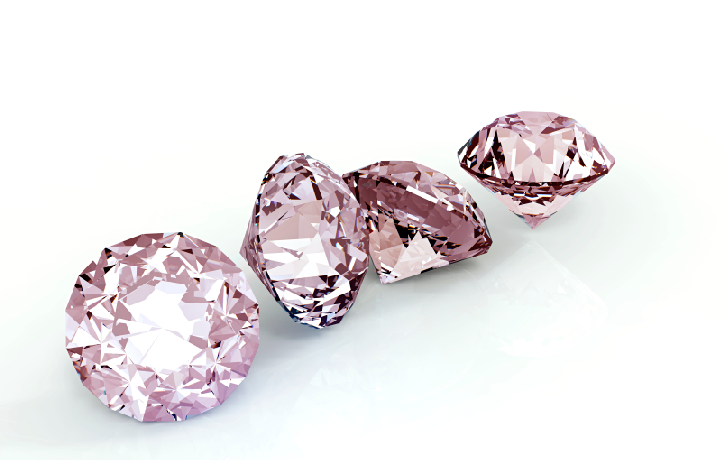 In 2017 the Pink Star diamond resurfaced to set the record for the most valuable pink diamond in the world, and the most expensive colored diamond to have ever been sold at a public auction, essentially dethroning both the Graff Pink and Oppenheimer Blue Diamond respectively. The hammer price; a truly massive $71.2 million paid by renowned Hong Kong Jewelry Retailer Chow Tai Fook. 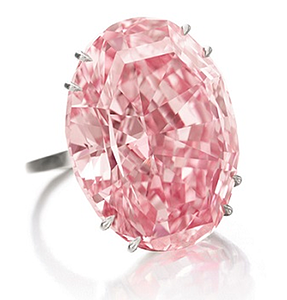 Previously owned by Harry Winston as a part of his private collection, the Graff Pink largely stayed out of the public until 2010, where it surfaced at Sotheby’s Magnificent Jewels Sale in Geneva. Initially thought it would fetch between $27 million and $38 million, the diamond exceeded everyone's expectations, ultimately yielding a hammer price of $46 million. 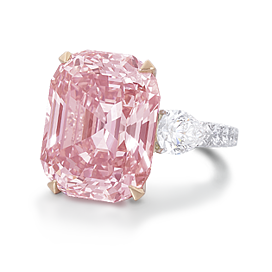 The buyer was non-other than Laurence Graff, making this gem among the most expensive single jewels to have ever been publicly sold at a public auction (until 2017 when the Pink Star came to rise). Once acquired, Graff saw that the stone still had massive potential, and decided to have the diamond re-cut and re-polished, a very risky feat as he could have potentially reduced the stone's value considerably. High risk, however, can sometimes be followed by high reward. By shaving the initially 24.78 carats to 23.88, Graff managed to bring out the stone's maximum potential, transforming it into a truly breathtaking, rectangular cut, Internally Flawless, Vivid Pink gem. 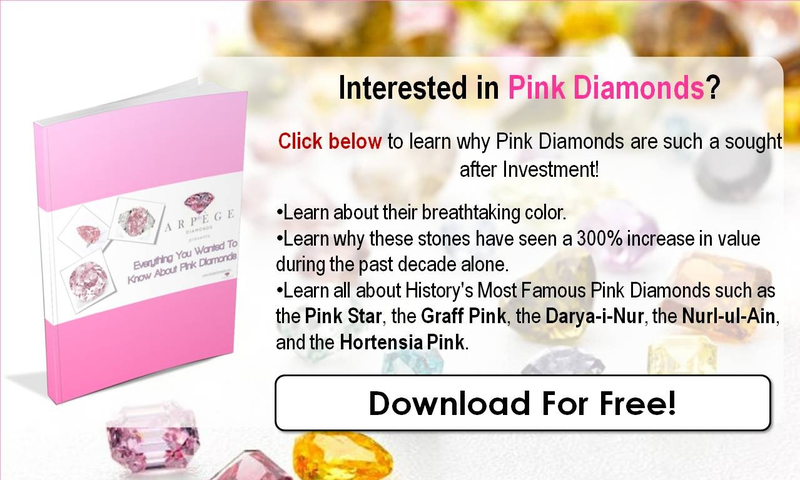 Another intriguing pink diamond is referred to as the Darya-Ye-Noor or the “Sea of Light.” It originated in India and has a very interesting history. It was initially in the possession of the Kakatiya Dynasty in the early 1000’s CE, but was later stolen by the Khilji dynasty and given to the first Moghul Emperor of India. In 1739, King Nadir Shah of Persia invaded the city of Delhi and Agra, where the gem was looted. During the reign of Naser al-Din, the stone was integrated into an extravagant frame that signified the Aryan origins of Iran. A set of 477 diamonds and 4 rubies were added between the two symbols of a lion and a sun. After many decades, the diamond currently sits in the same frame and is in the possession of the Iranian Crown Jewels. 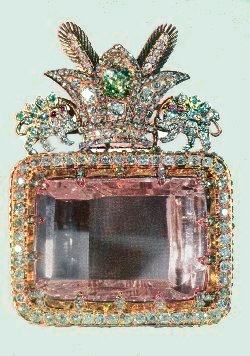 It is an estimated 186 carats and thought to be a cut from the Great Table Diamond, a long lost pink stone that is said to be over 400 carats. The complementing diamond to Darya-Ye-Noor is the Noor-ul-Ain stone which translates to “The Light of the Eye.” Also thought to be part of the Great Table Diamond, the Noor-ul-Ain displays a pale pink color and weighs nearly 60 carats. It was discovered in the Golconda mines of India and was also brought to the Iranian Imperial collection after King Nadir Shah looted the city of Delhi and Agra in the 18th century. 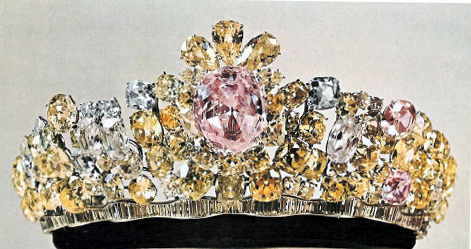 Today, the gem is the centerpiece of a tiara made for the Iranian Empress, Fara Pahlavi, which contains a total of 324 diamonds. And there you have it. 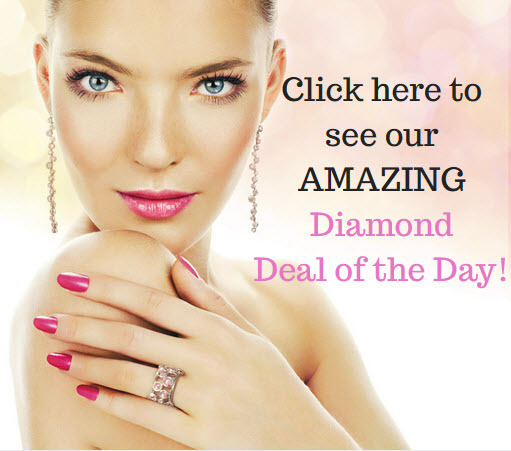 Is there a diamond you think is missing from our list? Do you have any questions? Let us know! And as always feel free to follow us on Twitter and LinkedIn.